Alex D. Boutilier was born in Sydney Mines, Cape Breton and grew up in the shadow of Princess Colliery. His interest in history started as a teenager when he began doing research on his paternal family. His ancestors were among the Foreign Protestants, or Huguenots from Montbeliard, France who arrived in Halifax in 1752 and went on to found Lunenburg in 1753. He has a keen interest in the culture, customs, and traditions of diverse societies having travelled extensively throughout England and France visiting medieval churches, museums, archaeological sites, and ancient ruins. 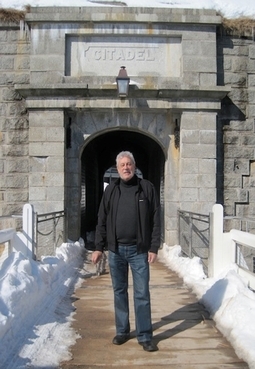 He has also toured all of the British and French fortifications in the Maritimes and eastern Canada. Alex believes that history is not fixed in time; that it is constantly changing as new information is uncovered/revealed. His preferred authors include social historians, such as J.C. Furnas, cultural writers like Arthur Koestler, the literary critic, Harold Bloom, and his favourite playwright is the great bard, William Shakespeare. Alex loves studying, researching, and writing social history, which he finds highly informative and suggests it can be “unexpectedly hilarious” at times. Alex studied at Saint Mary’s University and graduated with degrees in English and psychology, as well as an MA in Atlantic Canada Studies. From 1998 to 2005, he was an instructor for the Saint Mary’s Writing Centre. His first publication, The Citadel on Stage was based on detailed research done for his Master’s thesis. From 14th Colony to Confederation is the second in a trilogy. The third, Evolution of the Middle-Class in Nova Scotia is a work in progress and should be ready for publication in 2019. Alex’ lifelong occupation was in sales and marketing for several industrial corporations. He currently lives in Fall River, N. S. with his wife, Rosanne.